Normally people buy lobsters in supermarkets to eat, but a woman from Ontario had other plans. 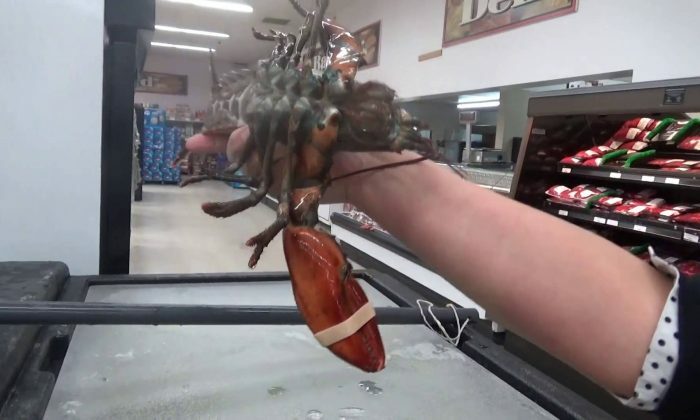 Christine Loughead spotted a lobster that goes by the name of Lobby Joe sitting in a tank in a supermarket in the northwestern Ontario town of Red Lake, with other dead animals surrounding it. “It weighed on my psyche more and more,” Loughead, who is vegan, told the Canadian Broadcasting Corporation. According to the Independent, Loughead bought the lobster for $20.23 and put it in a salt-water tank in her house, but she did not plan to keep it as a pet. So, she researched online looking for the lobster’s home. After some extensive research, she discovered that there’s a high chance it was taken from the coast of Nova Scotia. Loughead then reached out to vegans in Halifax on Facebook, wanting their help to take the lobster back to where it came from. Beth Kent of Bridgewater, who stopped eating meat 35 years ago after opening an animal shelter, responded to Loughhead and agreed to set the lobster free according to the Independent. Loughead drove six hours to a delivery point, where they ship live animals, to have the lobster packed up in a styrofoam box with cold packs and wet newspaper. Once packed, she paid $225 and sent Lobby to Halifax. Now, it was up to Kent to finish the task—to look for the right location. Kent later found a small cove, and right on cue, “… he straightened out and walked over the rocks,” she said—home sweet home.